This is not a post about cupcakes, if that’s what you’re after. The thing with me is I don’t have a sweet tooth, so I give more of my attention to the appetizers and main courses rather than the desserts. Even stranger still is that I like my desserts not-so-sweet. So I often go for cheesecakes, or chocolate-based desserts infused with a strong minty flavor, or baked pastries with just the right mix of cream and fruits. The more contrasting, the better. Pure, simple sweetness bores me. I like my palate to be stimulated by complex flavors. This is why I want to talk about an item in the menu of the Vanilla Cupcake Factory that barely gets the spotlight. 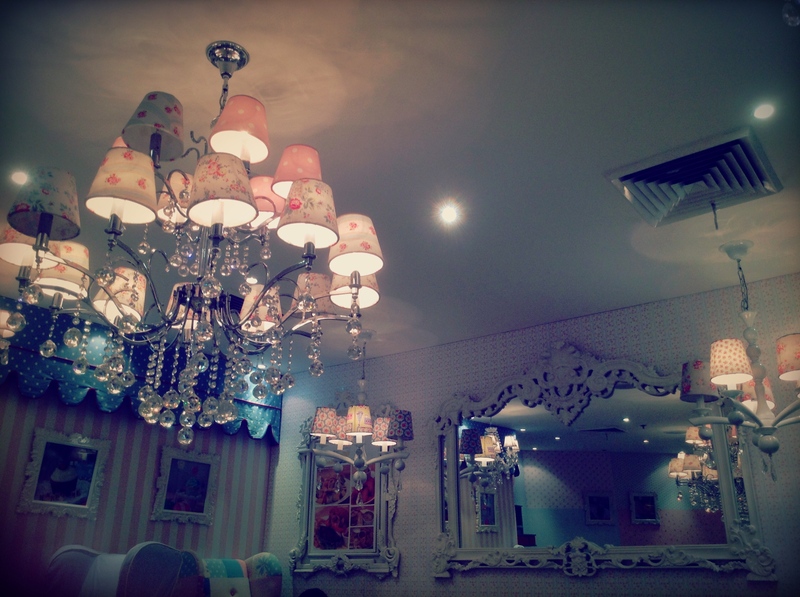 Obviously, people go to this place to ogle at the cozy and cute, girly decor (very much like stepping inside a dollhouse!) and to sample what most people get curious about – their prized cupcakes, of course. But, I urge you to against the grain and try having lunch or dinner here, instead of the usual afternoon tea. Which is just what my friend Irrisse and I did one busy weeknight when we decided to go against the busy-doctor stereotype and ACTUALLY MEET UP. 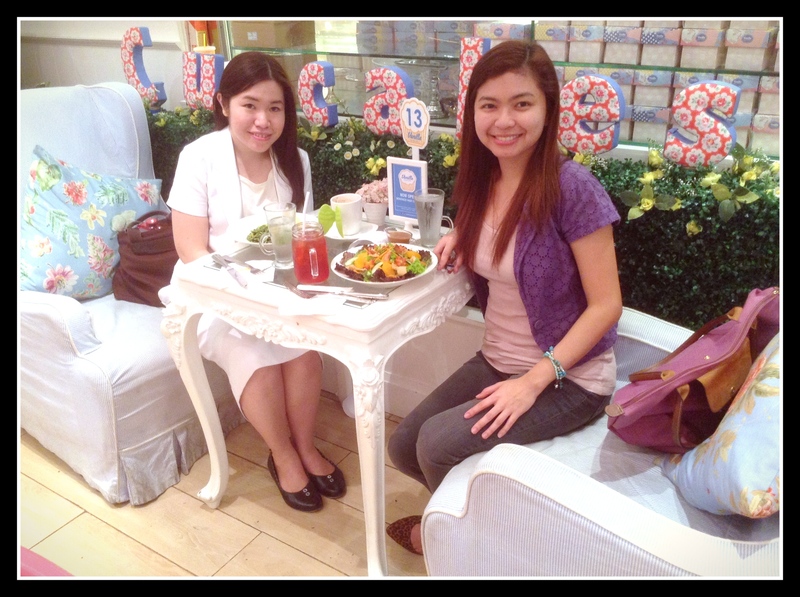 We’ve barely seen each other because we’ve been doing our respective trainings in different hospitals. But, no matter how “busy” you may be, investing time and energy in maintaining and refreshing meaningful relationships should always be a priority. Who says doctors can’t have a quiet night away from the hospital? 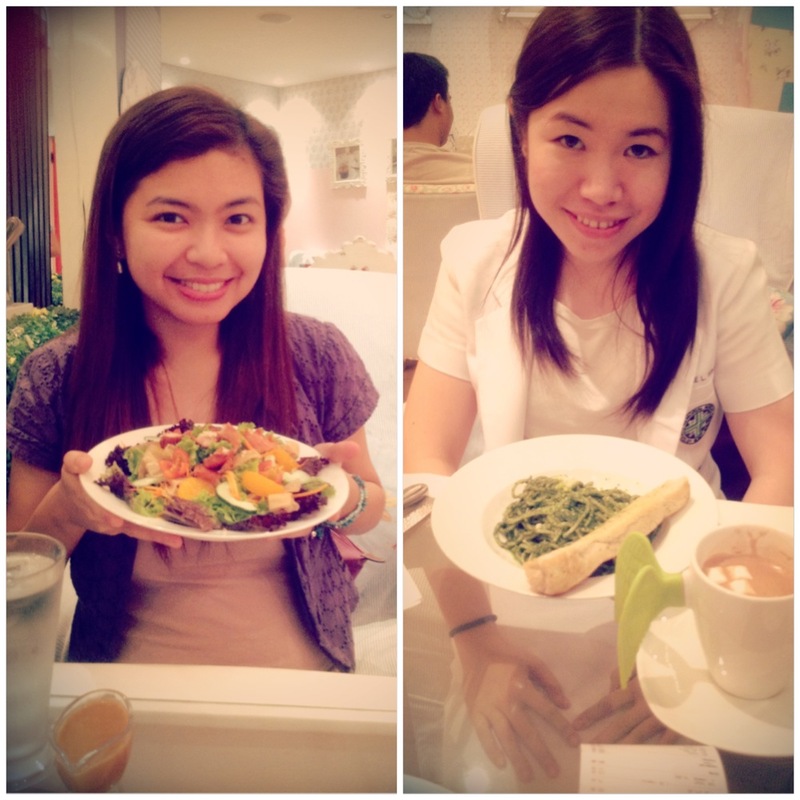 For this date, Irrisse ordered her ultimate favorite: pasta slathered in pesto. But a few minutes later, I saw what was on my plate. Damn. So much color. They say that the more colorful and vibrant your fruit and vegetables are, the more nutrients they contain. Well, I hoped so. But at that moment, all I could think of was THIS SALAD WAS SO, SO BEAUTIFUL. It was picture-perfect. It reminded me of a laid-back summer afternoon on a secret little getaway. It’s like the kind of food you would use in a spread inspired by the book Eat, Pray, Love. Since I’m a photographer at heart (but a writer by soul), I also cared that the drink I chose matched the salad very well. I got the Vanilla Iced Tea, loving it for its warm, red liquid sparkling in a vintage Mason jar. How classy! After satisfying the shutterbug in me (every meal has to be preceded by snap-snap-snaps of my IPad camera first hahaha), I then indulged my tastebuds. OMG. This is one of the MOST CREATIVE and BEST salads I have ever tasted. Two happy girls. Good food should not be a luxury, but a pleasure to be enjoyed. I love that they mixed salty and sweet, succulent and crunchy, and leaves with wonton wrappers!!! The Cajun chicken strips definitely made me feel gratified because the fried saltiness and crisp of it added some punch to the bed of greens and the oranges. The Asian sesame dressing was more savory than creamy and I liked it because it made for a LIVELY salad, instead of a boring, healthy-means-safe combination. I definitely recommend this salad. It is very filling, it is a meal in itself already, and it goes well with the vanilla iced tea. As for the vanilla iced tea, it’s mildly-flavored and thank God, not too sugary. It’s a nice alternative to all those caffeinated beverages we all guzzle down these days. I appreciate the Vanilla Cupcake Bakery for making their NON-CUPCAKES as interesting as their cupcakes. Their attention to detail in decorating their place never fails to feel homey and full of visual treats. I like that they featured the beautiful chairs of Ms. Daphne Osena-Paez as part of their furnishings. Most of all, I like that I have a place I can take my girly and bakla friends to, pretending it is our own personal boudoir, where we can have long conversations, glam photo-ops, and happy discoveries. It exudes Old Hollywood glam when shot in black and white. Classic! 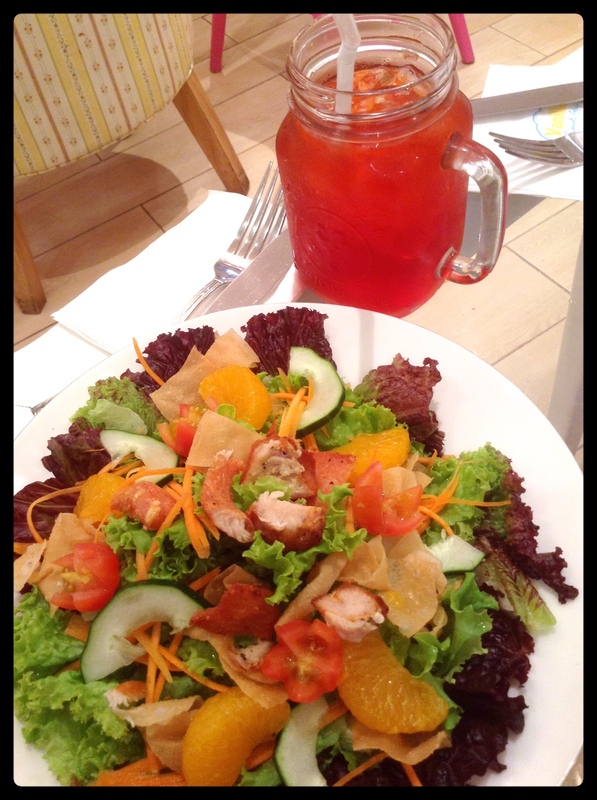 For me, Crunchy Chicken and Orange Salad is one discovery I will always crave for, when salads come to mind. 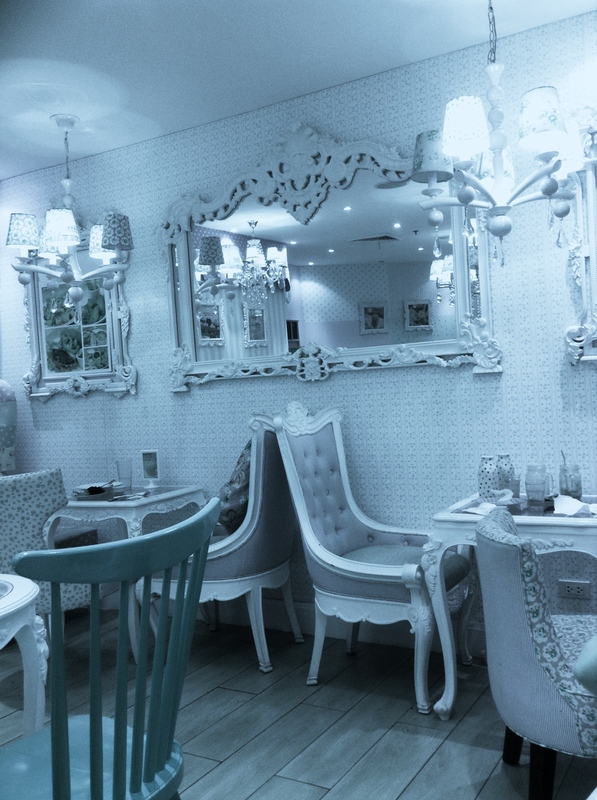 Congratulations to the Vanilla Cupcake Bakery! P.P.S. This wonderful bakery and cafe is brought to you by the same people who created Kamiseta. In fact, they have a branch WITHIN the Kamiseta store in Trinoma. Check it out for some serious destressing – shopping and sweets never fail to cheer people up.